Care Experienced people and their family and friends came together to watch the Paramount Pictures Movie ‘Instant Family‘, starring Mark Wahlberg and Rose Byrne. The film was inspired by the real-life experience of director Sean Anders, who adopted three children in America. He opened the Who Cares? Screening with a specially shot video message, saying he wanted the film to show realistic portrayals of real children and young people with experience of the care system. The film is a touching and humorous account of a couple who become foster parents to three children, including a teenage girl. It documents the complex combination of challenges and rewards that come with becoming an ‘instant family’. The film was well received by Who Cares? Scotland members who spoke afterwards of how it represented their lives, and how it was ‘essential viewing’ for the public. Sean Anders, Director, gave Who Cares? Scotland permission to do this advance screening. 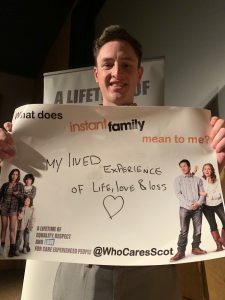 INSTANT FAMILY_SeanAnders_WhoCaresScotland from Who Cares? Scotland on Vimeo. This is what some of those who saw it today said about the movie. Join in on Care Day 2019 activities across Scotland. Everyone can play a role.